What a road trip (in a good way)! 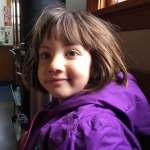 I was dreading it many ways (5 hours driving with three children), but also quietly confident (as they’d been incredibly awesome for me all week – whilst their Daddy was working away overseas). We left our home in Wellington at 9.30am on a Saturday morning, trying to keep how nervous puppy reassured that good friends were arriving soon to stay with him in our absence (he kept trying to escape out the front door and into the car every time we loaded another bag in). We drove off with the car bingo sheets held enthusiastically in each child’s grip (though my 12 year old is more of a young adult – in a good way, than a child) and I was wondering how long the game would last. 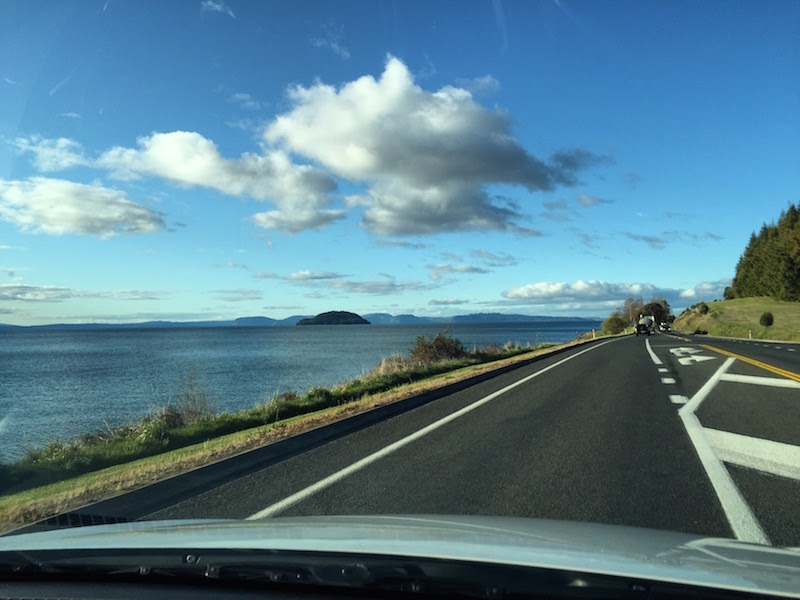 I’d chosen quite a Kiwi themed car bingo (thanks Kiwi Holiday Parks), which included spotting a Maori carving, someone wearing jandals, shorts and gumboots, a volcano, an All Blacks flag and some road kill…! They had ticked off the Maori carving before we’d even left Wellington! Anyway, I was pleasantly surprised that the car bingo was still ensuing, in a harmonious, team spirited way, for almost an hour into the five hour drive. My youngest daughter, Alice (aged 5), got a bit tired at that stage (trying to look for a black sheep in amongst the thousands of white will do that). 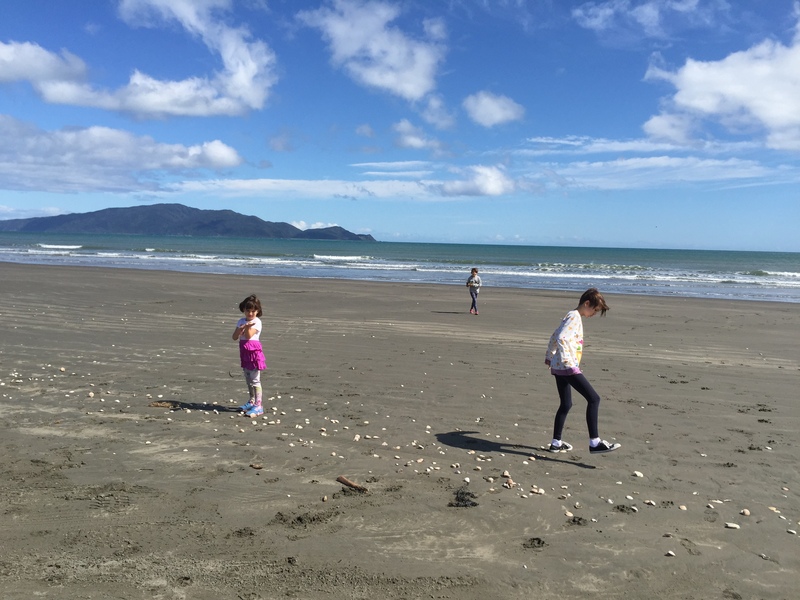 As we drove along the stunning Kapiti Coast I reminisced about day-trips we’d had there in the past and a couple of memorable holidays staying at a bach on the beach in Te Horo. 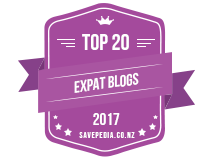 There were so many places I wanted to stop off at – Lindale, the Nikau Forest, the beaches, Queen Elizabeth Country Park for a tram ride and horse ride, the Southward Car Museum, and many more, but we ended up pulling up at Peka Peka Beach, where ‘Happy Feet’ (as he was later named) the Emperor Penguin was found and rescued one bitterly cold winter’s day in 2011. 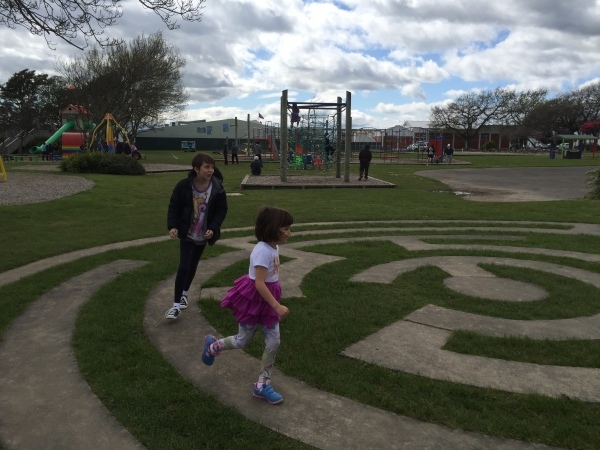 After a brief pit stop we got back in the car for half an hour longer, stopping at the amazing Levin Adventure Playground. WOW! What a place! If only all towns in the world could have a playground like this one – it would definitely deter children away from the screens and keep them fit. My girls and I spent at least half an hour climbing, running, balancing, swinging and even doing a few sit ups, pull ups and other weight bearing exercises (oh and there was an awesome flying fox too!). Feeling fresher and well exercised we got back into the car, loaded up with a latte for the driver and refreshments for my girls. I planned to put my foot to the pedal and motor on for as far as I could for the next hour to two hours, as my youngest was ready to have a nap. 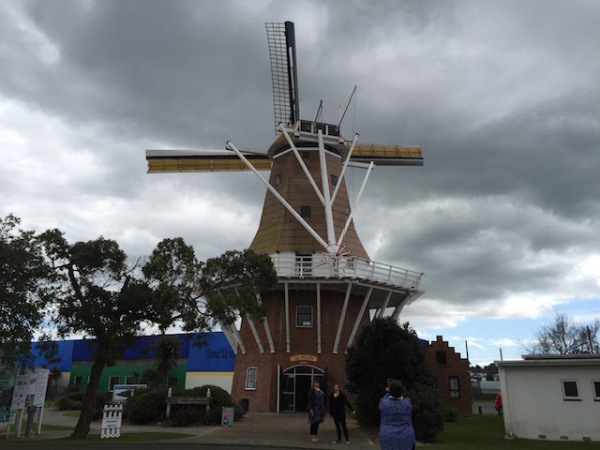 Though she held out just long enough for us to see the windmill in Foxton and take a road-trip pit-stop photograph (the windmill wasn’t on the car bingo list, but it was one of those ‘got to be seen’ iconic things on a road trip)! She then promptly fell asleep to the beats of Imagine Dragons, alternating with my oldest daughter’s love of Pentatonix (which has become a firm school run favourite), as well as various songs from Wicked: The Untold Story of the Witches of Oz – a musical with music and lyrics by Stephen Schwartz and book by Winnie Holzman. 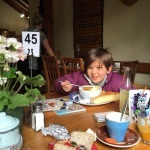 Our next stop was ‘The Brown Sugar Cafe’ in Taihape (a memorable stop for hubby and I in our before children days – as we used to stop off there on a Friday night, driving up to Ohakune, for a weekend of skiing). We arrived early afternoon, after the lunch-time rush, and enjoyed a good feed and a browse of the wonderful array of items they have for sale. 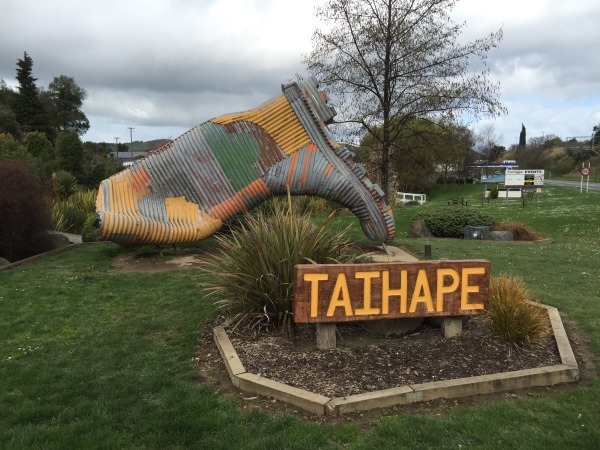 We couldn’t leave Taihape without taking a photograph of a gumboot (the girls took some convincing as I told them about the annual gumboot throwing contest and that Taihape was indeed the gumboot capital of the world!). 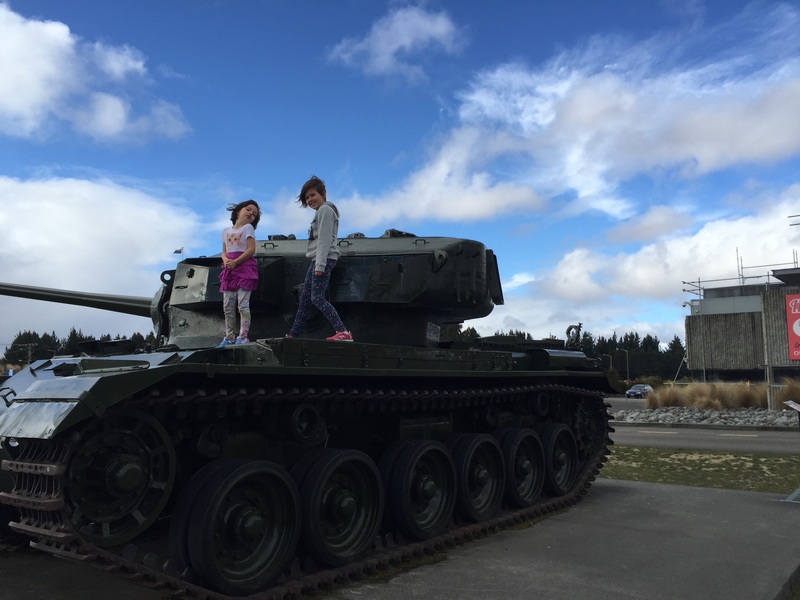 They wouldn’t all get out the car for a photo in front of the gumboot (though my 9 year old daughter, Sophie, got out and took a selfie of herself in front of the giant sculptured gumboot), whilst I took a standard postcard shot for posterity. Back on the road we got, with a full tank of petrol, toward volcano country (one for the car bingo!). 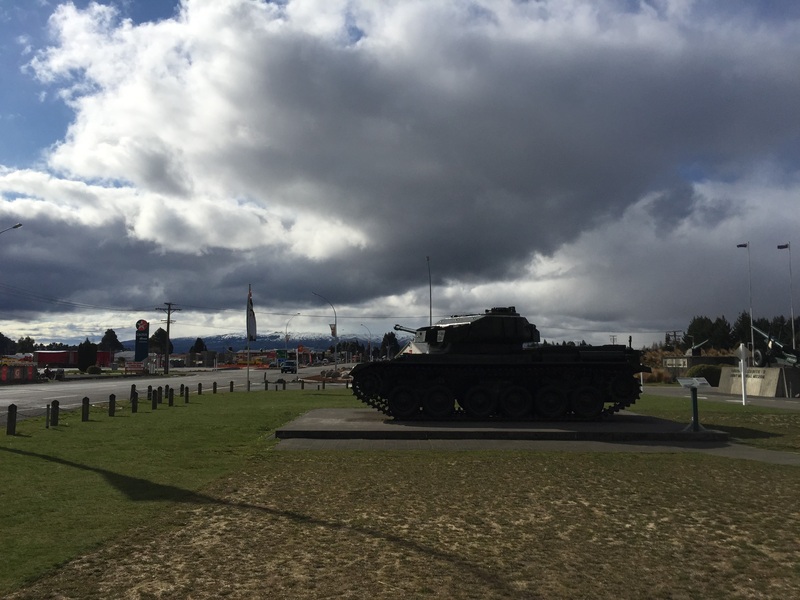 Just as the snowy terrain of the distant Mt Ruapehu rose to greet us on the horizon, we approached the Waiouru Army Museum. We made a quick stop here, for a visit to the toilets and a climb on a tank, planning to visit properly on our return road-trip on Friday. 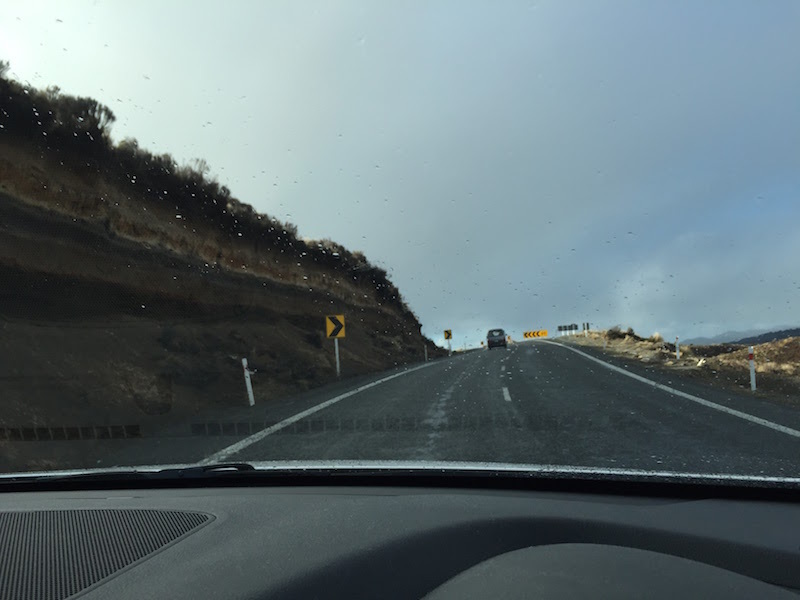 Driving along Desert Road, through Rangipo Desert, we were all awake and focused on the snow clad volcanic terrain rising up to meet the ominously heavy cloud cover sitting heavy atop it. 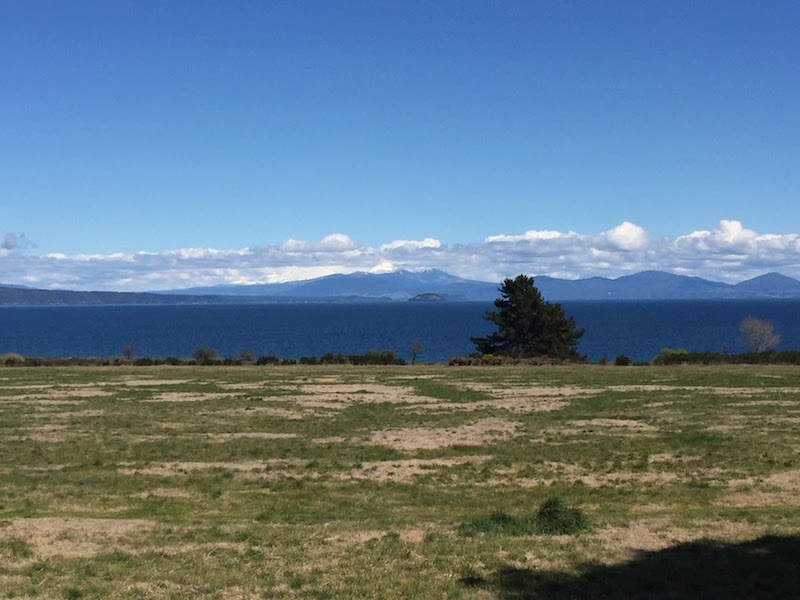 The land around us, only inhabited by the strongest of flora and the Kaimanawa Wild Horses. The amazing ‘chocolate like’ layers of different rock sediment had us all fascinated. By this stage of the journey we were becoming more aware of the reaching our final destination, Taupo. It was with great excitement that we turned a corner and got a glimpse of the giant lake ahead of us. Memories of earlier holidays came flooding back to me and I smiled in hearing my youngest daughter’s reactions at seeing new territory with her own eyes for the first time (my older girls had vague memories of earlier trips, kept fresh with the copious photos I’ve taken over the years and stories I tell them, over and over again of ‘Do you remember when…?’). 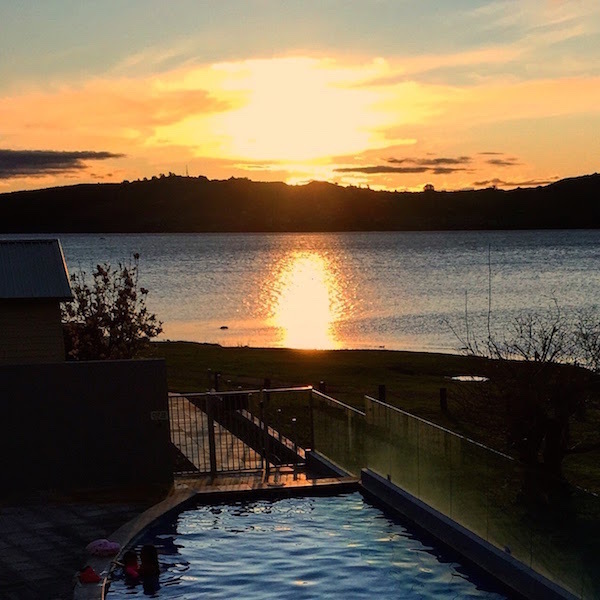 The girls were all very keen to reach our lake front apartment before sunset – so they could enjoy a dip in the swimming pool (but I was personally focused on stopping off at the supermarket in Turangi to stock up on supplies and much needed wine for the night ahead!). After a quick supply stop we drove onto our final destination, spotting the trout fishermen, along the way. We reached our gorgeous apartment (hubby had really surprised us with an amazing place to stay!) with a good hour to spare before darkness. The girls helped me unpack the car before diving in the swimming pool (which was thankfully heated!). The sunset colour, reflecting back from the surface of the lake, were absolutely glorious. After a swim, a bath / shower and a few board games we were ready for bed and so excited to go to sleep knowing we’d see the man of the house the next day, after a long eight sleeps of missing him. Here’s our road trip video. We did it! 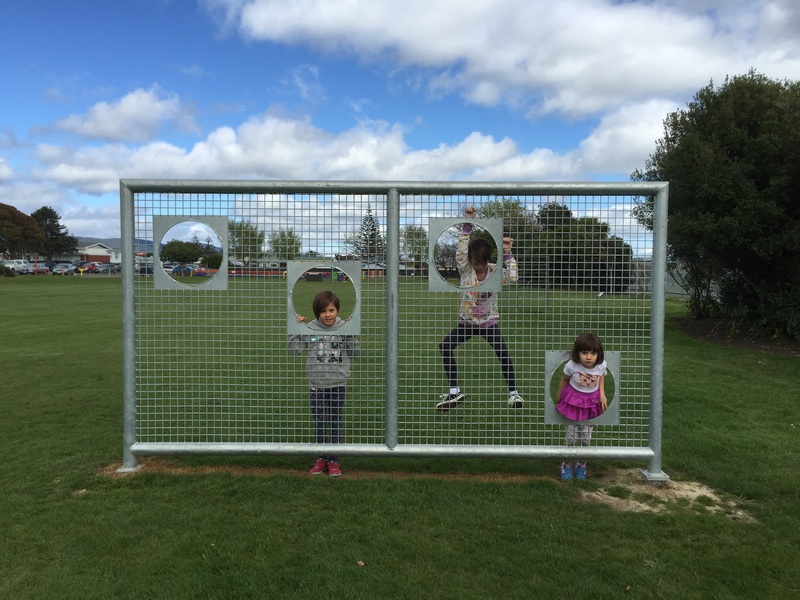 Adventures, Country Kids, Holidays, Playgrounds & Parks, School hols holiday, road trip. permalink.